RJD leader Tejashwi Yadav, who released the manifesto at the party headquarters here, said the main aim was to provide "bread to each plate and pens to all hands". "We are committed to social justice and will implement remaining recommendations of the Mandal Commission," he said. 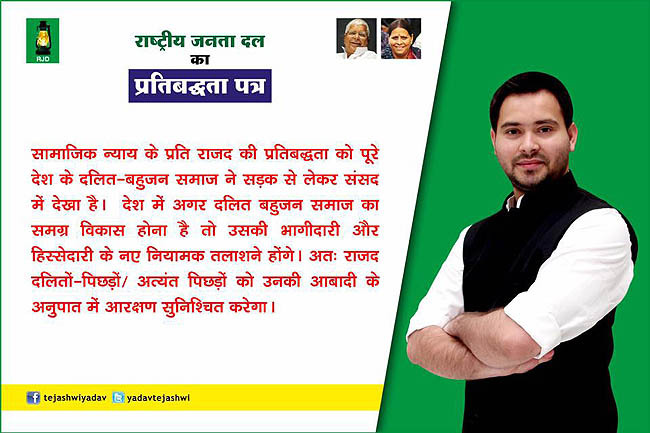 Tejashwi Yadav, former Deputy Chief Minister and the younger son of jailed RJD chief Lalu Prasad, said if his party was voted to power, a helpline for migrant workers from Bihar would be set up to provide them with timely help. He also said that his party will implement a 200-point roster and will amend the Constitution for reservation for government jobs. According to the manifesto, the RJD has ensured to conduct a caste-based census in 2021. Tejashwi Yadav said the party has decided to spend 6 per cent of the GDP on education and 4 per cent on healthcare. RJD has promised a tax free toddy to woo a particular Dalit community and to give a relief to millions of daily consumers of it. Toddy is locally known as the 'poor man's beer', is consumed particularly in rural Bihar. The seven-phase election in Bihar is scheduled from April 11 to May 19.